The FCCOC is for owners and fans of the Ford Consul Classic & Consul Capri models which were manufactured from 1961 until 1964. Also known as the 109e or 116e (right-hand drive) and 110e or 117e (left-hand). Models include the Consul 315 (known as the Consul Classic on the domestic market), which came in 2-door and 4-door variants, standard and deluxe, 1340cc and 1498cc, and the Consul 335 (Consul Capri), 1340cc and 1498cc, also available as 1498cc GT. We have an extensive spares programme, including replacement panels, trim and mechanical parts. We have one or two Autojumble meetings a year (spring & autumn) usually held in Essex, and attend various shows around the country arranged by other clubs and organisations. Contact details are here. The club is based in the UK, but overseas members are welcome. We have members in France, Germany, Australia, New Zealand, Iceland, Ireland, Italy, Denmark, Spain, The Netherlands, Sweden, Romania, Norway, Malta, Canada and USA. 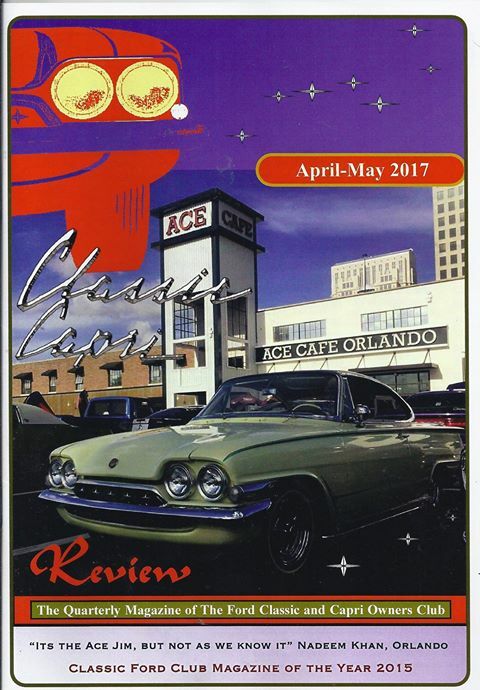 The quarterly magazine includes technical & historic articles, as well as reviews of meetings & events. There is also a free classified section where members can buy & sell cars & parts. New members can join now by selecting the join-now button below and completing the required details.